Nashville, TN – United States Attorney David Rivera honored two Franklin Police Detectives at a ceremony today in Nashville. 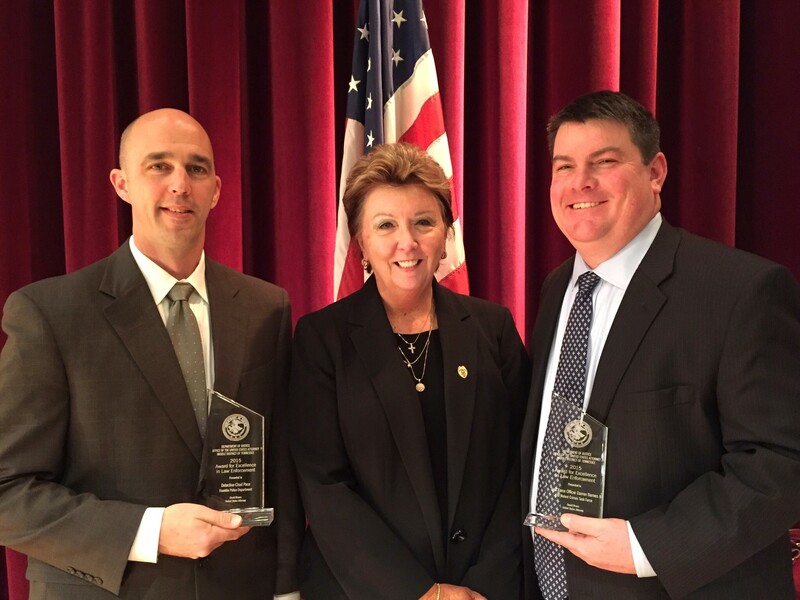 Franklin Police Detectives Darren Barnes and Chad Pace were among those honored with the 2015 Award for Excellence in Law Enforcement. In 2014, Detective Darren Barnes, assigned to the FBI Violent Crimes Task Force, was instrumental in helping to identify and track a dangerous and extremely violent Nashville bank robber to Memphis. There, he was captured during his attempted escape from a police SWAT Team. The suspect was ultimately sentenced to 25 years in federal prison. His getaway driver was sentenced to eight years. In 2012, Detective Chad Pace worked with Murfreesboro Police and federal authorities to identify a man who stole nearly $180,000 in donation checks from the mailboxes of area churches. The man fled to Mexico, but was extradited back to the United States and ultimately sentenced to 45 months in federal prison.